This is such a great sentiment! You did a beautiful job coloring and love the white pen accents you added! Love the colors of your card. Thanks for the inspiration. Such a beautifully designed card! Love this!! Great sentiment. Lovely handwriting. That sweet little heart is perfection. So pretty with these colors and I like the striped border. Beautiful card!! Love the strip of black & white & the gorgeous garden! Your colors are very pretty, love the blue background. 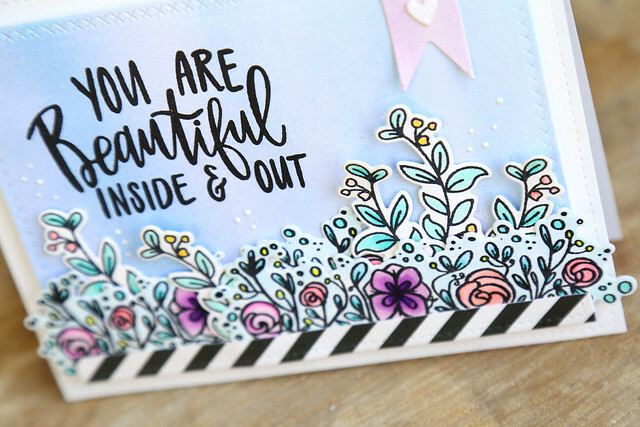 What a pretty garden of flowers...plus I agree the sentiment hand writing is stunning! Gorgeous card, I love how you arranged the blooms and sprigs. Love the garden you created. That sentiment is so great. Wow! Adorable blooming card!!! Love so much your colouring!!! Beautiful card!! This is such a fantastic sentiment set. And the flowers are so pretty. Such beautiful blossoms and a happy card!! Will thrill whoever receives it for sure! This card is so pretty! I love it! So pretty! Love the beautiful Bloom set! This is so pretty! I love the layered florals coming up from the bottom! The background is vey, very, very cool!!!! What a gorgeous card! 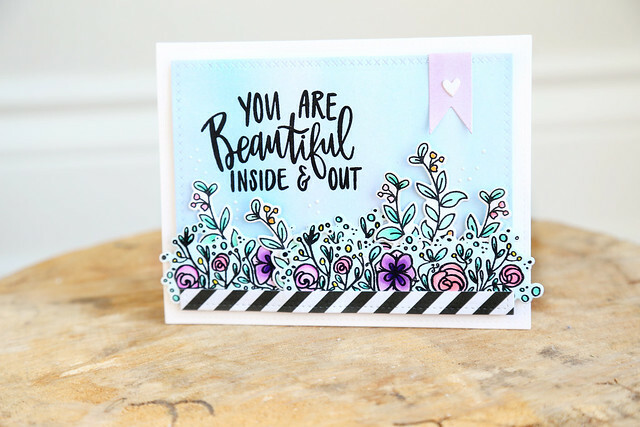 Love how you layered up the flowers against the sky blue background that helped frame that lovely sentiment. And that black and white stripe at the bottom adds just the right something! Thanks so much for sharing! I love the background you made for this card! It's very peaceful and draws your attention to the message. Great release and love your beautiful card.